One can explore Grade II to III+ rapids like Crossfire, Three Blind Mice, Return to Sender, Golf Course, Roller Coaster and double trouble. 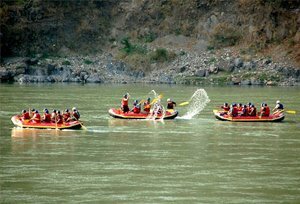 The third closest point to embark on a rafting expedition is from Rishikesh. This spot has gained worldwide popularity among novice rafters. Irrespective of whether you’re looking for an adventure packed trip or a comprehensive family outing, Marine Drive is the ideal point. In order to have a safe and enjoyable experience, a word of advice from the experts is a must. A few extra rapids are capable of lacing up your adventure to another level altogether, as compared with Shivpuri. The difficulty level involved is moderate. However, you should be appropriately braced in case some mis-hap is likely to occur. Day 01: Welcome to the divine city of Rishikesh in the morning at our camp, on arrival welcome drink will be served and beach camps will be allotted to the group. After taking some rest, get ready for a jungle trek to the pristine waterfall. After spending an unforgettable time near the waterfall, transfer to the camp. Enjoy the mouthwatering hot buffet lunch and then spend some relaxing time by exploring the area or indulging in the exciting camp activities and games like cricket, badminton and volleyball. In the evening, enjoy a hot cup of tea with delicious snacks and bonfire. Dinner and relaxing overnight stay at the camp. Day 02: Early morning, you can have a cup of coffee and a hearty breakfast. 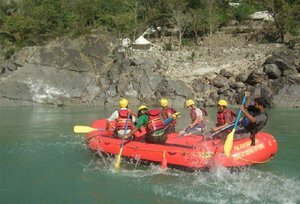 Leave the camp and start river rafting from Marine Drive to Rishikesh (24 km). Experience rafting through the rowdy rapids like the Initiation, Return to Sender, Double Trouble and Hilton. Besides river rafting, you also can also carry out body surfing and cliff jumping. Float past the beautiful temples, ashrams and Ghats nestled across the pious river Ganga. Arrive at your camp in Rishikesh with lifelong memories to cherish forever. Day 01 : Welcome to the sacred city of Rishikesh in the morning at our camp. On arrival welcome drink will be served and designated beach camps will be allotted to the group. After some rest our guide will take you for a memorable jungle trek to the magnificent Neerghar waterfall. After spending a wonderful time near the waterfall, transfer to the camp. Enjoy the scrumptious hot buffet lunch and then spend some relaxing time by exploring the area or indulging in the exciting camp activities and games like cricket, badminton and volleyball. In the evening, enjoy a hot cup of tea with delicious snacks and bonfire. Dinner and relaxing overnight stay at the camp. Day 02 : Early morning, you can have a cup of coffee and a hearty breakfast. Leave the camp and start river rafting from Marine Drive to Ram Jhula or NIM Beach (24 Kms). Navigate through the wild rapids like the Roller Coaster and Golf Course. Besides river rafting, you also can also carry out body surfing and cliff jumping. After rafting sessions you will be transferred back at beach camp. Have a lunch in the camp and keep yourself engaged by playing camp games and activities. In the evening, enjoy light snacks with bonfire. Dinner and comfortable overnight stay at the camp. Day 03 : Morning be ready for adventure activities like rock climbing, rappelling at camp itself. Later have breakfast and leave the camp for your onward journey.